I just found a copy of some video of me shot around 1999 for an early Internet video program called PepperScott Television. It's a bit dated, but an interesting take on myself at the time, what I had done, and where I was going. Well it's happening again, I'm playing at the annual Harvest Festival and it should, as always, rock. In fact the logo above has a shot of the tent stage I'll be playing in. If you've never been, but live in the area, consider going. It's always filled with my favorite DJs of the area, is nice land and features good sound systems. I also ordered a new soundcard to DJ with, so either my set will sound awesome, or or it'll be silent while I figure out Why I Fail So Hard. Just wanted to post a note about my gret uncle Sandy who passed away last week. If any of you saw Death Race 2000 made in 1975, he was The President. The only interesteing image I could find of him was a web writeup that you see displayed here — looks like that's where my brothers and I might have inherited our knack for making faces. 🙂 If you click the image, it should link to the official online writeup. My dad sent me this Guest Book for him after I first posted this article. So on April 5th somehow I was hit by a train. Pretty much damage is just to my skull. And my ego. I literally “woke up” only 3 weeks ago. I think I was walking and didn't hear it coming, but I can't remember anything. Well, looks like it's going to be a busy weekend for me; playing two awesome events in the city. A little late to post on the site, but consider signing up to the mailing list. look at. Definitely explore through the links to find out all the cool little things going on. 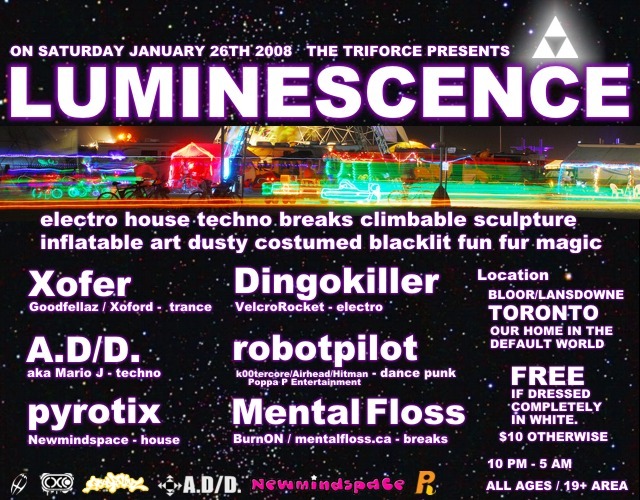 The second event is Luminescence put on by a bunch of folks including Newmindspace, the group responsible for a lot of great spontaneous public space events like Pillow Fight, Light Saber Battle and Capture The Flag. My set starts at 1:30am, spinning breaks. I had the opportunity to play at a Boreal canoe trip to Moon River the other week, and Andy Johnson was kind enough to record a good chunk of the set. Thanks be to Andy! Boreal’s generally a yearly (or twice yearly) canoe trip for 150 people organized primarily by Justin/Alieninflux who also does Harvest Festival, with assistance from a core group friends and all of us campers. It’s a good mix of some minimal/dub techno, house and stuff in-between, and the crowd freakin’ rawked! Completely prepared to have a good time and very appreciative of all the music for the night. You can use the player below for instant gratification, or download it for your iPodding pleasure. I'm happy to be playing the first Promise Cherry Beach Sunday this coming weekend. There was some fear that they might not be able to continue but all's good. Come out and chill in the sun! hi, David and Irving here. We’re really happy to announce that Sunday afternoons down at Cherry Beach will be continuing this summer for the 6th year! With the controversy at the end of last summer, all winter long we were concerned that we had reached an end of an era. After 5 years of sweet, mellow anarchy and community in the sun, it was frustrating to think we wouldn’t be able to listen to music and dance in the park with friends, family and pets. We got lots of good advice from the Kensington Car Free Sundays people Shamez and Kelsey, Jason from Councillor Joe Pantalone’s office, Ari from the Trinity Bellwoods Tuesday drumming group, our smart political friend Mike Layton, the Toronto Public Space Committee, Gregory Nixon from Live with Culture, and Kevin and Lori from NewMindSpace, and went into action this spring to encourage local councillor Paula Fletcher to support us. Paula understood that this Sunday gathering is fantastic on many levels and she was very willing to throw her support behind it. We wrote up a proposal to the City and now they’ve given us a permit and blessing to continue. This type of fun is a viable part of great cities like New York, Paris, Montreal and Madrid. Toronto just got way cooler. Bring a frisbee, bring a kite, bring a handy sweater, bring a dog (only nice dogs), bring your lover and a hammock. And pass the time on this lazy sunny Sunday afternoon with friends and friends of friends. Rollin Cash – break beats from the birthday boy – congratulations Roland! Directions to Cherry Beach and the new location – With consideration to ongoing construction and landscaping, the site may move around the park from weekend to weekend, which is kind of interesting. We have a meeting at the beach friday morning with Parks staff to determine the location for this Sunday. We will email and let you know in the evening just where it is. Biking to Cherry Beach is easy along the paths beside the lake, and a bus from Union Station goes there too. Things to think about – Please bring only what you plan to take back out with you, leave no trace! Pack something warm (it gets cool after dark by the lake) and something to sit on and also something to keep sun off your head. Drink lots of water. Bring something to share. And remember how key it is to take care of your friends, your neighbours, and what's going on around you. It's what makes Cherry Beach happen smoothly. We have been asked by Parks to put a lid on public consumption of alcohol, which is reasonable. It’s delicate and we have a trial permit, so understand that alcohol in public spaces is not ok. David and Irving will need to keep an eye out, so please don’t let us see any. We will have friends helping to remind people of this over the weekend. If we all cooperate here, then we get to have our good times. For the past 5 years the picnic’s been free. Now with the permit, insurance, soundsystem and other weekly expenses, we’d like to ask for your help. From time to time we’ll be passing around a hat, please contribute as you are able. Thanks a lot! Over the course of the summer there’s about 80 djs, bands and artists that perform. We’d love your help and suggestions and any contacts you may have to make the performances happen. Last summer’s stunning hit was the Jimmy Swift Band from Nova Scotia, arranged by our friend Derek in synch with the band’s appearance at NXNE. If you’re bringing in a dj or band or performance, ask them to make an appearance at the beach part of their weekend in Toronto. They may embrace the chance to play outdoors, away from the hype and lights of a club, to a happy and enthusiastic crowd like ours. Think big and let us know. We’d like to give our deep thanks to Pat and Councillor Paula Fletcher, Sandy Straw and Jaime McCaig at Toronto Parks, Jason and Councillor Joe Pantalone, the Toronto Public Space Committee, Shamez and Kelsey, Ari, Mike, Jason, Kevin and Lori, Wade, Joey, Jonathan, Gregory, Charlotte, Ayla, Katie, Lyen, Linda, Bettina and Emily, Justin, Tomasz, and Robbi-Anne. And, most of all, please thank yourselves for the huge influx of letters of support to city council. Pat and Paula told us how impressed they were with them. Their office get lots of angry and aggressive complaints. Your letters were refreshingly upbeat, mature and personally engaging. Way to go everyone! We did it! Thanks for reading, see you Sunday! For those in Guelph, here's a nice little event out on a farm with a bunch of friends from the OM Festival. Smokers: please bring a tin or film canister to dispose of your butts. to a local watering hole! usually grenadilla or rosewood & sometimes bamboo. African-American fife and drum music can be traced back to the Civil war. 2003 at the age of 94.
it early, so drop them an email if you'd like to come out.